Donnie Harrison has been ousted as Wake County Sheriff. WAKE COUNTY, N.C. (WTVD) -- Donnie Harrison's bid for a fifth term as sheriff of Wake County failed Tuesday night. Voters chose challenger Gerald Baker, a former deputy with 28 years of service with the Wake County Sheriff's Office, instead. "This is what this has been about for me in terms of trying to get in here and create a sheriff's office that's going to serve every community, not just some, but everyone," Baker said. "Sometimes that's hard to do. I realize that. But you've got to make sure that you are really, really trying to do that." The two lawmen disagreed on policy issues, specifically the decision by Harrison to participate in a federal program that allows local officers to work with ICE agents to detain undocumented immigrants. Baker criticized that arrangement, as well as the way Harrison managed the sheriff's office. "They don't call us when they need us for the very serious things that are going on in their neighborhoods because they're more worried about somebody being deported than us coming to help them," Baker said of Latino residents. "I had concerns about, you know, the deportation of some folks for what appeared to be some very minor things, breaking up families and things like that." The decision by Harrison to retain a Wake County deputy charged with assault after turning a K-9 dog on an unarmed man was also questioned by Baker during the campaign. "I know that young man. I care a lot about him. He's a good officer," Baker said. "He made a bad decision and that should have been dealt with." Harrison defended his decision in the case. "Any of us, him included, deserves the right to go to trial like anybody else," the outgoing sheriff said. "And before I fire him, like I say, I'll quit. And it looks like I am." he added with a laugh. 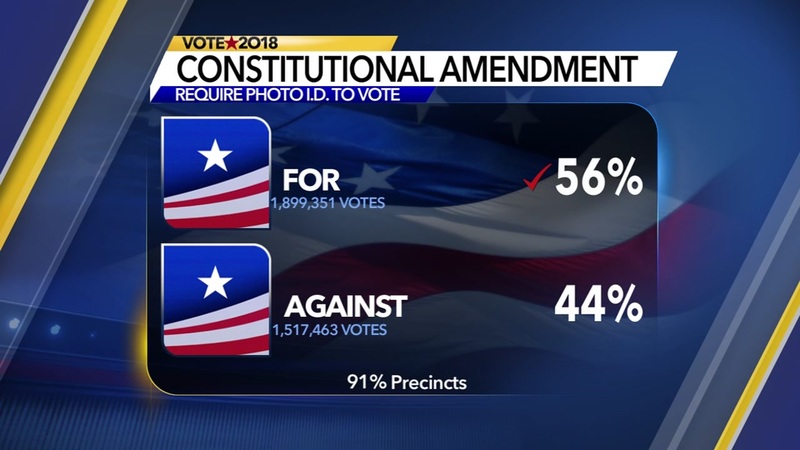 Voters said no Tuesday to two amendments shifting power to legislators from the governor, while an amendment requiring a photo ID to vote and three others passed. Harrison said Wake County's increasingly left-leaning bent contributed to his failure to get re-elected. "It was just a wave that hit Wake County," Harrison said. "It's been harder and harder for a Republican to win in Wake County in years past, and I think this time, when the wave come through, I got caught up in it. And, you know, that's politics." Still, Harrison said he feels grateful for the opportunity to be the county's top law officer. "To be the sheriff of the largest county in this state, I've been totally blessed," Harrison said. "And I thank them for their support and told them give the new guy a chance. And he's the new sheriff. Treat him like a sheriff and give him the opportunity to prove himself."